Integrated GMES project on Land Cover and Vegetation. Geoland2 project aims at developing and demonstrating a range of reliable, affordable and cost efficient European geo-information services, supporting the implementation of European directives and their national implementation, as well as European and International policies. Funded by European Commission (EC) within the FP7, the projects goal is to realize a major step forward in the implementation of the GMES Land Monitoring Core Service (LMCS). The three components (Local, Continental and Global) of the LMCS are addressed. to propose and demonstrate a concrete functional organisation of the LMCS. 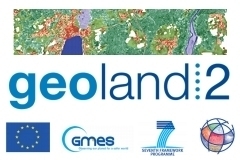 Geoland2 efforts will rely on the assets of previous or ongoing projects funded under FP6 (Geoland, Boss4GMES), by ESA (GSE projects “Land”, “Forest Monitoring”, “GMFS”, “SAGE”, “Urban Services”) and EEA’s ”CLC/FTS 2006” project. The key word for Geoland was “consolidate”, the focus of the GSEs was “demonstrate services”, and now the focus for Geoland2 is “build: design, integrate, and test operational processing lines, demonstrate large scale products, build robust provider-user relationships”. The architecture of Geoland2 is made of two different layers, the Core Mapping Services (CMS) and the Core Information Services (CIS). TheCMS produce ‘basic’ land cover, land cover change, and land state products which are of broad generic use and can be directly used for deriving more elaborated products. The CMS products cover a wide variety of thematic content, spatial scales from local to global, and update frequency, from 1 day to several years. The CIS are a set of thematic elements that start from CMS products and other data sources to produce ‘elaborated’ information products addressing specific European policies. They are in direct contact with institutional end-users in charge of European policies and Member State policies which have a generic pan-European character. They serve to estimate the added value of the CMS in comparison to existing approaches and to carry out a utility assessment of selected end-to-end service demonstrations. Land Cover & Land use (EUROLAND): At local scale, EUROLAND produces VHR Urban Atlas inventory and change, with 22 classes at 0.25 ha MMU, according to the new Urban Atlas specification approved by DG REGIO in November 2007, on several tens of European cities. At continental scale, it produces over Europe and demonstration sites HR Land Cover inventory and change with 21 classes plus 4 Forest classes and Forest Density at 1-5 ha MMU. Biogeophysical Parameters (BioPar): BioPar produces in near real time and off-line a series of biogeophysical parameters describing the continental vegetation state, the radiation budget at the surface and the water cycle. The biogeophysical parameters are derived mostly with MR and LR data, at a global or continental scale; the time frequency of product update is on the order of 1 - 30 days. Seasonal & Annual Change Monitoring (SATChMo): SATChMo operates at continental scale over Europe and Su-Saharan Africa. It delivers: (i) a VHR/HR Area Frame Sampling over permanent samples representative for all European and African environmental / ecological conditions for annual statistics of land cover & land cover change; (ii) a complete MR continental coverage of seasonal and annual vegetation parameters to produce land cover change and agricultural land use. The time frequency of the product update is on the order of 3 - 12 months. Planetek Italia has a relevant experiences Service Provider for GUS, GSE LAND, GMES FOREST land use maps to users in Italy and Spain. The main Geoland 2 objective is to constitute an important step forwards in the complete operativity of GMES Land Monitoring Core Services (GMES LMCS). Planetek Italia contribute, within the Urban Atlas component team, to improve the product processing chain by increasing the semi-automatic processes and find new technical solutions taking advantage from new sensor capabilities for an efficient update of the Urban Atlas map . The project foresees an integration and testing phase followed by a demonstration activity over some of the major cities in Europe. User - Group: International, European, national and regional user organisations covering policy making, harmonisation, reporting and monitoring mandates. Research Partners: Mainly public institutions representing the current state-of-the art knowledge. Service Providers: Public and private service providers (including R&D departments). Article on the European Journal of Remote Sensing "Synergy between Gmes and Regional Innovation Strategies: Very High Resolution Images for Local Planning and Monitoring"